A grand gift of gratitude! Sip your way to a beautiful day with this comforting gift. 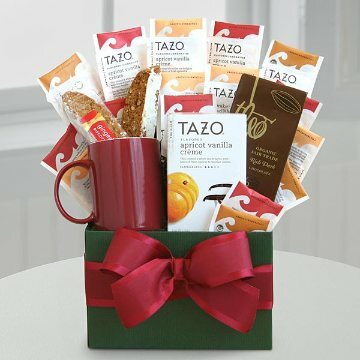 This basket is stocked with an assortment of the finest Tazo® Teas to be enjoyed in a comfy mug and . This gift is presented in a simple but elegant box. This gift includes the following: Tazo Zen tea, Passion tea, Organic Chai tea, and Earl Grey tea. An earthenware ceramic mug. Topped off with the sweetness of a Theo organic chocolate bar and 2 biscotti cookies.